Honestly, I thought everyone already knew this. I started writing this post a month ago, but it seemed like old hat, so I wandered off to do things like reading books and visiting the kids in Indianapolis. And Christmas shopping. Lots and lots of Christmas shopping. And writing another book. But as I talked to more horse owners and riders, I began to get the drift that this only seems old hat to me because I'd spent the majority of my life in the classroom. High School. Special Ed. Save your sympathy; it was more fun than anyone should legally be allowed to have. I totally hearted my job. So taking a break from proofing the new book, I revisited my saved blog ideas, and when this one popped up at the top I thought I'd better get on it. See, learning theory isn't just for kids or rescue horses. It's for everyone, human and horse alike. This photo shows Zip giving me a hug, and that's exactly what he was doing. But this is learned behavior. 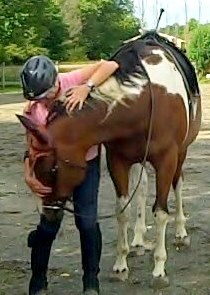 Horses do hug--each other, their human friends, other species that won't eat them--but in this case Zip was not a natural hugger. I had to take him outside his spooky little discomfort zone to show him it was okay to let down his guard to this extent even when no cookies were anywhere in the vicinity. How do you teach anyone to do anything? Well, humans have a leg up on the process because they can talk about it. I can say to you, "Now I'm going to show you how to walk on a tightrope", and then I can show you and you'll know what to focus on. Other species don't quite get our verbal means of communication. We have to take a different approach. We have to use what they've already got and work outward from there. Think about teaching an infant human to talk. You can't very well say, "Now I'm going to teach you to speak the Queen's English." You start by picking up on the baby's intent focus on your face and you wait till you see him beginning to mimic your expressions. Once the mimicking begins, and you reinforce that (you can't cookie an infant, but laughing and the occasional finger full of applesauce work wonders) so he knows he's on the right path, then you can get him to mimic other things. Any mother of a toddler knows that they are awesome mimics. Getting them to stop saying those words you didn't mean for them to hear is the hard part. 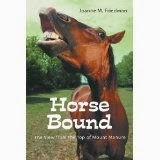 Horses don't so much mimic as they look for clues as to what in the hell we want from them. They're very physical. They react to physical stimuli. And they like to eat. 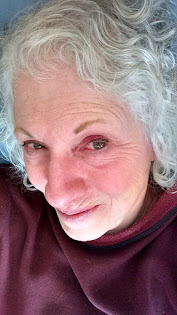 Put those together and use their natural proclivity to do things like move into pressure or move away from irritating taps from your "magic stick", and you've got the basis for communication. You're teaching him how to learn from you. Analyze the task you want him to accomplish, break it down into tiny bits, then build the bits into the final task. BINGO! But the important point to get about all learning theory is that it works best when the learner (all Teacher Stuff begins with "The Learner Will"....TLW) makes a mistake that can be pinpointed and corrected. You can click-treat your horse for four hours until he seems to have gotten the whole trailer loading thing down pat. But until he makes a mistake and turns around or backs out over you or whacks his head on the roof, you don't know just how much he really knows. So don't take those failures as failures. They're not. They're guideposts. They point to the next lesson. When the guideposts no longer appear, then you're at your destination, but they can be miles and hours and days and months apart, so never stop looking for them. "Baby steps" means precisely that. Take your time, and you'll both learn your lessons well. When I logged on to Blogger this morning, I found a bunch of really wonderful comments that I'd never published. It wasn't because I didn't like them. It was because I didn't know they were there. I honestly figured everyone had lost interest in my ramblings. In case you're not a Googlephile, you probably don't know that all that is Google has been in flux. Caught in the flux was the notifications system for blog comments. I do apologize. I've published all the comments that were languishing in my "please check t his stuff" spot. Thank you all! I heart my readers as much as I hearted my teaching job!